Runtime: 1 hr. 58 mins. 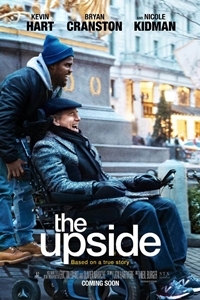 The Upside is a serviceable English-language remake of The Intouchables, a 2011 success at the French box office. Anchored by strong performances and a palpable chemistry between leads Kevin Hart and Bryan Cranston, The Upside breathes life and freshness into a cliched plot. Disappointingly, however, the filmmakers opt for a straightforward re-telling rather than reworking the story to give it a life of its own. The Upside works for many of the same reasons that The Intouchables worked but, like any echo, it's neither as loud nor as powerful. Part of the problem may be that the directors of the original (Olivier Nakache and Eric Toldeano) essentially made a Hollywood movie (albeit in French), which left little room for the American production team - director Neil Burger and screenwriter Jon Hartmere - to embellish. The Upside has been dogged by problems not of its own making. With its rights held by The Weinstein Company, the film (originally slated for a late 2017 opening) went into limbo when the Harvey Weinstein sexual abuse scandal broke. It languished until it was bought by STX Entertainment. The "safe harbor" January 2019 release became anything but that when The Upside cruised into theaters in the immediate wake of the controversy surrounding Hart's dismissal as the host of The Oscars. Whether the latter situation will help or hurt the movie's performance is undetermined. The Upside falls loosely into the "mismatched buddy film" genre in which two people with radically different personalities are thrown together by circumstances and, after a period of tension and disagreement, form a bond. Race, class, and physical disability mark the differences here. Hart's Dell Scott is a penniless ex-con with no home and no job prospects. Cranston's Phillip Lacasse is one of the richest men in the world. He resides in an exclusive Manhattan penthouse. But, as a result of a paragliding accident, he's a quadriplegic. He lives his life in a chair that he moves by blowing into a tube. When Dell's loyal secretary, Yvonne (Nicole Kidman), decides that her boss needs a regular caregiver - someone who can be available 24/7 on a live-in basis - she arranges interviews. Through a series of miscommunications, Dell ends up "interviewing" for the job, even though all he wants is for someone to sign his parole sheet to say he was looking for employment. Phillip, who is suicidal, likes the idea of someone unsuitable looking after him. At first, Dell's service falls between neglectful and incompetent but, as time passes, he learns to do the work and his unconventional approach gives Phillip a renewed hopefulness about the future. Yes, the material sounds like it deserves a rousing "Kumbaya!" but the performances give it a little salt and vinegar. Hart, attempting to show his chops as a dramatic actor, is more successful than many comedians making the jump. If one didn't know anything about his past, one wouldn't assume his "day job" involved stand-up. It's a workmanlike portrayal - not Oscar-worthy but more than passable. Equally impressive is Bryan Cranston's effort as Phillip. Able to use only his face and voice, Cranston nevertheless conveys a full body's worth of reactions. Although the interaction between this Odd Couple isn't as openly humorous as that between Felix and Oscar, there are some funny moments when Hart's comedic aptitude comes into play and Cranston is the straight man. (The bit with the catheter is an example.) The movie is primarily a drama but, despite Phillip's initial death-wish, it avoids a dark trajectory. No one should mistake this for The Sea Inside. Supporting roles go Nicole Kidman as the secretary who has not-so-secret feelings for Phillip and Julianna Margulies as the pen-pal who agrees to a face-to-face meeting. The film's "feel good" intentions may turn off some cynical viewers and I'd agree that the movie could have used a harder edge. There's also a fair amount of padding - although they serve a narrative purpose, many of Dell's scenes with his family are slow and bring the film's momentum to a screeching halt. Those who haven't seen The Intouchables will likely enjoy The Upside a little more than those who have, but the film's predictability is offset by what Hart and Cranston bring to the proceedings.